Fresh off the main stage at this year’s Rocklahoma festival, Lizzy Borden will finally bring the “Appointment with death show” to the U.S. The AWD show received rave reviews in Europe and is now about to hit the United States in all its “Blood, sweat and cheers” glory. Starring: Lizzy Borden, Joey Scott, Marten Andersson, Dario Lorina and Chris Sanders. The Lizzy Borden Appointment with death show produced spectacular performances on the main stages of some of Europe’s biggest festivals like, “Sweden rock” (Sweden) “Bang your head “and “Keep it true” (Germany) “Kobetasonic ” (Spain) all to rave reviews unanimously declaring Lizzy Borden the hit of the festivals! Lizzy Borden will be performing all of the classic songs like “Me against the world” American metal” “Master of disguise” as well as the new singles “Tomorrow never comes” and “Under your skin” from the latest Lizzy Borden full length album “Appointment with death”, both songs feature dramatic videos and are in rotation on MTV2. The video “Tomorrow never comes” was nominated for video of the year on MTV2’s “Headbangers Ball”. 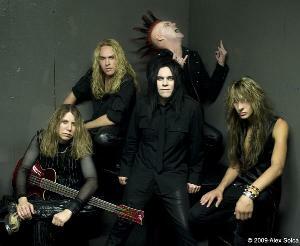 In a career spanning 26 years, Lizzy Borden was created in 1983 in Hollywood California. Spitting venom, stage blood and dripping grease paint while breathing life into bizarre characters bred precisely for the stage. Theme oriented creations such as, Love you to pieces (1985) Menace to society (1986) Visual Lies (1987) Master of Disguise (1989) Best Of (1994) Deal with the Devil (2000) and Appointment with death (2008) forever cemented icon status to the master showman from the dawn of heavy metal. Although I am sure you are familiar with the bands 26 year history, I would be grateful if you could check out the bands myspace or website at www.myspace.com/lizzybordenband or www.lizzyborden.com which has reviews, full details and sound bites from the bands new CD ‘Appointment with Death’ out now on Metal Blade Records.